The FAI Aviation & Space Education Commission (CIEA) held its Annual Plenary Meeting on 30 April and 1 May 2004 in Ankara, Turkey, under excellent arrangements made by the Turk Hava Kurumu. Elections : Mr Raymond J. JOHNSON (USA) was re-elected as CIEA President. 1st Vice-President Michiel M.W. KASTELEIJN (NED) and 2nd Vice-President Contessa Maria Fede CAPRONI (ITA) were also re-elected, while Mr Gordon HOFF (USA) was elected as the new CIEA Secretary; see the updated list of CIEA Officials & Delegates. Click here to view full results and winning paintings. 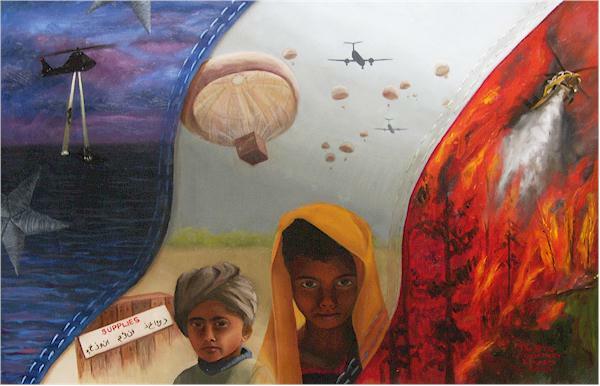 Mrs Gebb, President of the Jury, declared that the same theme had already been set 10 years ago, and that it was very interesting to see how children were much more aware of aviation being used for humanitarian reasons in 2004 than in 1994. FAI Recommended Museums : The Delegates decided to recommend to the FAI General Conference 2004 that the Norwegian Aviation Museum be part of the FAI Recommended Museums Program. CIEA contribution to FAI's Centenary : apart from the yearly Young Artists Contest, whose theme will be "Create an Airshow Poster, More than 100 Years of Human Flight", CIEA decided to mark FAI's Centenary in 2005 by publishing, in close cooperation with the Embry-Riddle Aeronautical University, Prescott (AZ), a CD-ROM containing all paintings that won a prize since the beginning of the FAI Young Artists Contest. In addition to these projects, CIEA decided to evaluate the feasibility of launching an international youth camp, and to continue developing its web-based directory of resource materials and programs for educators who teach young people about aviation. Next Plenary Meeting : Paris (FRA), 17 and 18 June 2005. 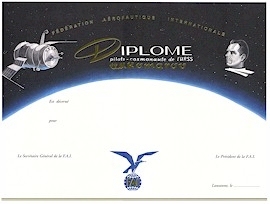 The FAI Astronautic Records Commission (ICARE) met in Lausanne on Friday, 30 April 2004. Elections : Mr Segismundo SANZ FERNANDEZ de CORDOBA (ESP) was re-elected President, and Mr John MILES (GBR), Vice President; see the updated list of ICARE Officials & Delegates. X Prize : Arrangements for FAI's involvement in the certification of claims for the "X Prize" were discussed. The first attempt to launch into space a manned space-ship that was financed and built privately is likely to take place soon, and in any case before the end of 2004 - the closing date for winning the prize. Awards : ICARE agreed to award the Yuri Gagarin Gold Medal to the ill-fated crew of STS 107, the space shuttle that burned up on re-entry last year. 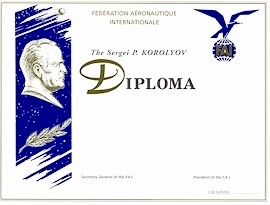 In addition, Komarov and Korolev Diplomas went respectively to the Crews of Expedition 7 and Expedition 6 to the International Space Station (click here to view pictures of these Diplomas and Medal). Next Plenary Meeting : Lausanne (SUI), 29 April 2005. Sub-class : O-5 (Hang Gliders with a rigid primary structure, movable control surface(s) without pilot surrounding structures and fairings.